When the Schaffer’s away… The Lugo will play! In the second seat this month we have the loveable Charles Stunning of Afterbirth Monkey. She sits in and gives us the scoop on Ghostbusters, the small desert town of Night Vale and the animated short Bee and Puppycat. Then Nelson chimes in on the hilarity of Brooklyn Nine-Nine and the brilliance of Rat Queens. Then they both start to give Schaffer the hate only to end up giving Schaffer the love. Our special guest this month is award winning story teller, musician, Neil Gaiman drunk texter and all round great guy Peter Aguero! He stops by to blow our minds with the raw power of the spoken word. How much cheese can Nelson eat? Should First Trade Chuck get a blog? Will Peter ever work out all his daddy issues? Is there a contest at the end of the show? Find out in this month’s jam packed episode! 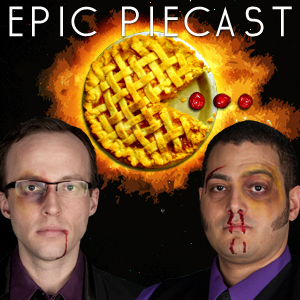 The opening theme of Epic Piecast was created by Afterbirth Monkey.